Not too many ships stop here, so the entire town seemed to show up for our arrival! 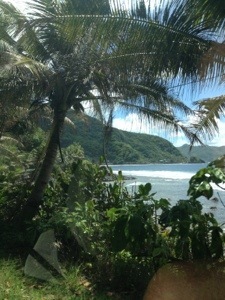 I headed to Tisa’s Beach for a day on the sand. 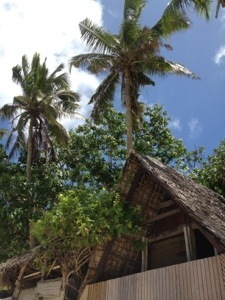 Nothing prepared me for the surreal beauty of this location; a barefoot bar hut built on a crescent of unspoiled beach! I truly feel like an explorer who just discovered a place all my own! 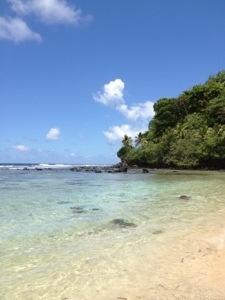 Samoa means “sacred Earth” and this beach delivers that in spades..
Back on Tisa’s, lunch is served! 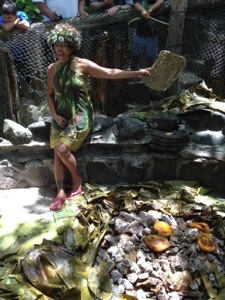 The Samoan people are so kind and extremely welcoming and they were anxious to share their Samoan delicacies prepared beneath coconut leaves and hot rocks. 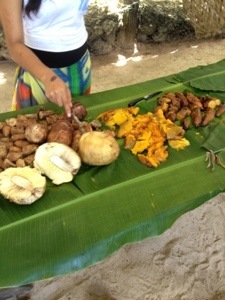 Tarot, coconut, and bananas cooked with turkey, lamb, and pork for hours until all is falling apart tender! Even though I may feel like a rare explorer, my days at sea have brought me to this island that many hearty travelers before me have visited and gone on to tell tales of for years…like James Michener who came here to write his 1946 classic “Tales of the South Pacific”. 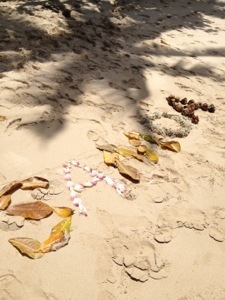 « Older Post Tropical Delight! 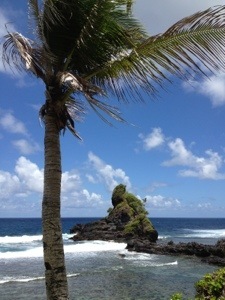 » Newer Post Off the Beaten Path to Inspiration! Looks lovely! Are you on a cruise of some sort? I’ve never been on one as i’m not sure how i’d find all the time on the water! That said, i spent a week sailing the greek islands on a yacht last year and had no problems (though of course, slightly different experience!) Hope you continue to enjoy your travels! Yes on a cruise! There are a lot of sea days! I love being on a boat…a yacht is always preferred if possible! 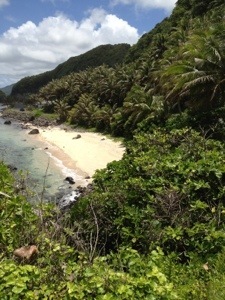 I think these remote spots are probably more inclined to sailing in as flights must be hard to come by!